I was born and raised in the beautiful city of Chania, at the scenic and historic island of Crete, Greece. After finishing school in 1993, I moved to the second most beautiful city of Greece, Thessaloniki, where I studied at the department of Electrical and Computer Engineering, in Aristotle University of Thessaloniki (AUTH). I received my diploma in 1998 and I came to MIT for graduate studies in 1999. I earned a MS in June 2001 and I completed my Ph.D. studies on September 2005, after an adventurous journey in the areas of cooperative wireless communications, distributed sensor networks, signal processing for communication, time/frequency metrology, materials science and nanotechnology. For my thesis, I designed optimal cooperative relay strategies that mimic the behavior of multi-antenna wireless links and improve performance and scale of wireless communication. I opted to balance information theoretic results proving optimality (across several dimensions), with actual implementation, and the proposed algorithms were demonstrated in custom, low cost radio hardware I designed and built. If you have time, you can check out the abstract, slides and video of my thesis defense: "Intelligent Antenna Sharing in Cooperative Diversity Wireless Networks". In this site, you can find project descriptions, videos of my demos and publications, covering most of the work I did during my term at MIT as a graduate student/Research Assistant. I apologize in advance for the fact that this web site is not complete or updated on a regular basis. Updated version of my web presence can be found HERE. I have worked as a visiting scientist at Radiocommunications Laboratory, Department of Physics, Aristotle University of Thessaloniki, as a postdoctoral fellow/consultant at MERL and conducted postdoctoral research at MIT in the areas of backscatter communications and cooperative networks. During summer 2009, I joined Electrical & Computer Engineering Dept., Technical University of Crete as an Assistant Professor. You can contact me at the above email address. Updated version of my web presence can be found HERE. Improving university functions should be top priority, otherwise austerity plan will be useless... Faculty of ECE Dept., TUC, expressed their frustration about the 28-year old university administration legislation and practices that have no similarities to what is happening at top institutions abroad. NOTE: Copyright © as noted on each article. Internal or personal use of this material is permitted. However, permission to reprint/republish this material for advertising or promotional purposes or for creating new collective works for resale or redistribution must be obtained from the copyright owner. By choosing to view one of these articles, you agree to all provisions of the copyright laws protecting it. Preprints available upon email request. [REGULARLY UPDATED LIST IS AVAILABLE HERE]. submitted for publication, August 2010. A. Bletsas, A. Lippman and J.N. Sahalos, "Zero-Feedback, Collaborative Beamforming for Emergency Radio: Asymptotic Analysis", Mobile Networks and Applications (MONET), best papers from IEEE ISWCS 09, submitted Feb. 2010, revised Sept. 2010. IEEE Transactions on Microwave Theory and Techniques (MTT), Vol. 58, No. 6, pp. 1502-1509, June 2010.
accepted, to appear in third quarter of 2010. Journal of the American Society for Information Science and Technology (JASIST), Vol. 60, Issue 12, pp. 2577-2586, December 2009. IEEE Transactions on Wireless Communications (TWC), Vol. 9, Issue 1, pp. 14-20, January 2010. IEEE Transactions on Wireless Communications (TWC), Vol. 8, No. 10, pp. 5018-5029, October 2009.
chapter 7 in "Cooperative Wireless Communications", pp. 73-92, Auerbach Publications, 2009. IEEE Transactions on Wireless Communications (TWC), Vol. 7, No. 6, pp. 2170-2179, June 2008. IEEE Transactions on Wireless Communications (TWC), Vol. 7, No. 5, pp. 1823-1827, May 2008. IEEE Transactions on Wireless Communications (TWC), Vol. 6, No. 9, pp. 3450-3460, September 2007. A. Bletsas, H. Shin and M.Z. Win, "Outage Analysis for Cooperative Communication with Multiple Amplify-and-Forward Relays", Electronics Letters (ELL), Vol. 43, No. 6, March 2007. IEEE Communications Letters (CL), Vol. 11, No. 3, March 2007. IEEE Communications Magazine (COMMAG), Vol. 44, No. 12, pp. 33-40, December 2006. IEEE Journal on Selected Areas of Communication (JSAC), Special Issue on 4G Wireless Systems (non-invited submission), Vol. 24, No. 3, pp. 659-672, March 2006. IEEE Transactions on Ultrasonics, Ferroelectrics and Frequency Control (TUFFC), Vol. 52, No. 9, pp. 1452-1460, September 2005. IEEE EUCAP 2010, April 2010, Barcelona, Spain. IEEE IWAT 2010, March 2010, Lisbon, Portugal. A. Polycarpou, A.G. Dimitriou, A. Bletsas and J.N. Sahalos, "RFID in Healthcare", COST Antenna Systems & Sensors for Information Technology Societies (ASSIST) Workshop, May 2009, Valencia, Spain. April 2009, Brno, Czech Republic. IEEE International Symposium on Wireless Communication Systems (ISWCS), September 2009, Siena, Italy, to appear. Selected as one of the five best papers. IEEE International Conference on Communications (ICC), June 2009, Dresden, Germany. A. Bletsas, S. Siachalou, J.N. Sahalos, "Anti-collision Tags for Backscatter Sensor Networks", 38th European Microwave Conference (EuMC), October 2008, Amsterdam, Netherlands. IEEE Personal Indoor Mobile Radio Communications Conference (PIMRC), September 2008, Cannes, France. E. Vaitsopoulos, A. Bletsas, J.N. Sahalos, "On the RFID Design with Passive Tags and a Butler Matrix Reader", 13th Biennial IEEE Conference on Electromagnetic Field Computation (CEFC), May 2008, Athens, Greece. A. Bletsas, J.N. Sahalos, "Antenna Enhancements for Backscatter Sensor Networks", COST Antenna Systems & Sensors for Information Technology Societies (ASSIST) Workshop, April 2008, Limassol, Cyprus. IEEE Personal Indoor Mobile Radio Communications Conference (PIMRC), September 2007, Athens, Greece. A. Bletsas, A. Khisti, M.Z. Win, "Low Complexity Virtual Antenna Arrays", ACM International Conference on Wireless Communications and Mobile Computing (IWCMC 2006), July 2006, Vancouver. A. Bletsas, A. Khisti, "The Diversity-Multiplexing Tradeoff in Cooperative Protocols with Relay Selection", MSRI Workshop on the Mathematics of Relaying, April 2006, Berkeley. A. Bletsas, H. Shin, M.Z. Win, "Outage-Optimal Cooperative Communications with Regenerative Relays", invited paper. 40th Conference on Information Sciences and Systems (CISS 2006), March 2006, Princeton. A. Bletsas, H. Shin, M.Z. Win, A. Lippman, "To Relay or Not To Relay? Cooperative Diversity with Opportunistic Relaying", IEEE Wireless Communications and Networking Conference (WCNC 2006), April 2006, Las Vegas. A. Bletsas, A. Lippman, D.P. Reed, "A Simple Distributed Method for Relay Selection in Cooperative Diversity Wireless Networks, based on Reciprocity and Channel Measurements", Proceedings of IEEE 61st Vehicular Technology Conference (VTC-Spring 2006), May 30 - June 1 2005, Stockholm, Sweden. A. Bletsas and A. Lippman, "Spontaneous Synchronization in Multi-hop Embedded Sensor Networks: Demonstration of a Server-free Approach" , Proceedings of IEEE Second European Workshop on Wireless Sensor Networks (EWSN 2005), January 31 - February 2 2005, Istanbul, Turkey, pp. 333-341. Institute of Standards and Technology, Boulder Colorado, March 4-7, 2003, pp. 27-32. Proceedings of 1st IEEE International Conference on Pervasive Computing and Communications (PerCom 2003), Dallas-Fort Worth Texas, March 23-26, 2003, pp. 289-296. B. Hubert, A. Bletsas, J. Jacobson, "Nano-Scale Structures Fabricated By All-Additive AFM -Assisted Nanoassembly", Materials Research Society (MRS), San Francisco, April 16-20, 2001. 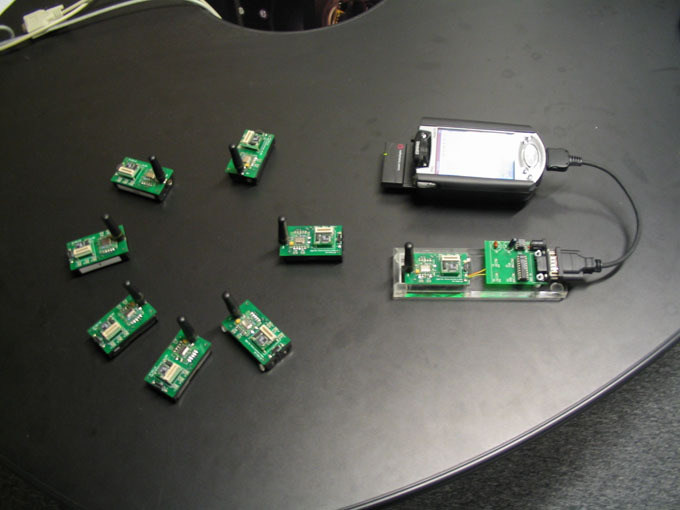 Cooperation in Practice in Wireless Communication and Networks, with Implementation Examples. Time Keeping in Myriad Networks: Theories, Solutions and Applications. M.S. in Media Arts and Sciences, MIT June 2001. Diploma in Electrical and Computer Engineering, Aristotle University of Thessaloniki, November 1998. Technical Report, MIT Media Lab, December 2003. A. Bletsas, "Natural Spontaneous Order in Wireless Sensor Networks: Time Synchronization Based on Entrainment", Technical Report, MIT Media Lab, December 2003. RF-Beatles: Inexpensive platform for wireless sensing and communication nodes Based on a 8051 mcu interfaced directly to a cheap radio module. Three versions have been built aiming to maximize functionality and minimize cost. No need for motes - we didn't like motes - expensive and not very flexible for the rf stuff we wanted to do - so, we designed our own "motes" from scratch and wrote all the necessary software. Esopos - Hellenic Text-to-Speech System A complete male voice text-to-speech system for the greek language, commercialized in 1999 by a private multimedia company. The original goal was a system for the mute and the blind. At that time, there was no commercially available system that people could use in their pc, for the greek language. Around 1999, people could find my software in computer stores. Best thesis award from Ericsson in 1999. It's /an/ /gje/ /los/ where /gje/ is palatal and its the same as /gje/ in "game" (/gje/ /eem/). When you are talking to me you should change the suffix and call me /an/ /gje/ /le/. When you are talking about me you use the /an/ /gje/ /los/ version. Also, the first /a/ is the same as in "mama" (/ma/ /ma/). Notice the small /n/ between /a/ and /gje/ - even though it is not written, it is still pronounced! Common mistakes: my name is not /an/ /gu/ /los/, /an/ /ga/ /los/ or /an/ /gjee/ /los/. It means "messenger" in greek. "Tolerating ambiguity is a sign of maturity..."